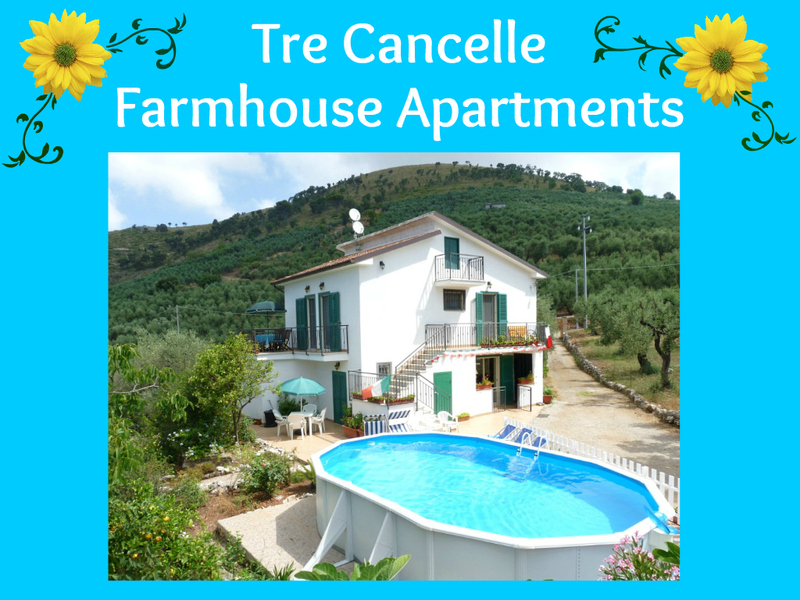 south lazio – "Tre Cancelle"
Maranola is a small medieval village overlooking the town of Formia on the South Lazio coast. Each Christmas-time the village puts on a wonderful “Living Nativity” known as the “Presepe Vivente“. Many of the local people take part in this project, and ground floor rooms and cellars undergo a transformation. Here living scenes are created depicting the every day life of days gone by. Some re-enact former occupations, ancient skills and crafts. Many of the townsfolk are dressed in the traditional costmes of the ancient region of Ciociaria. This area takes its name from the word “ciocie“, which is an ancient form of footware, thought to date back to Etruscan times. It was a type of sandal, with a curiously curved toe, that was bound to the calf with leather laces. It was typically worn by the local shepherds and peasants of the area. 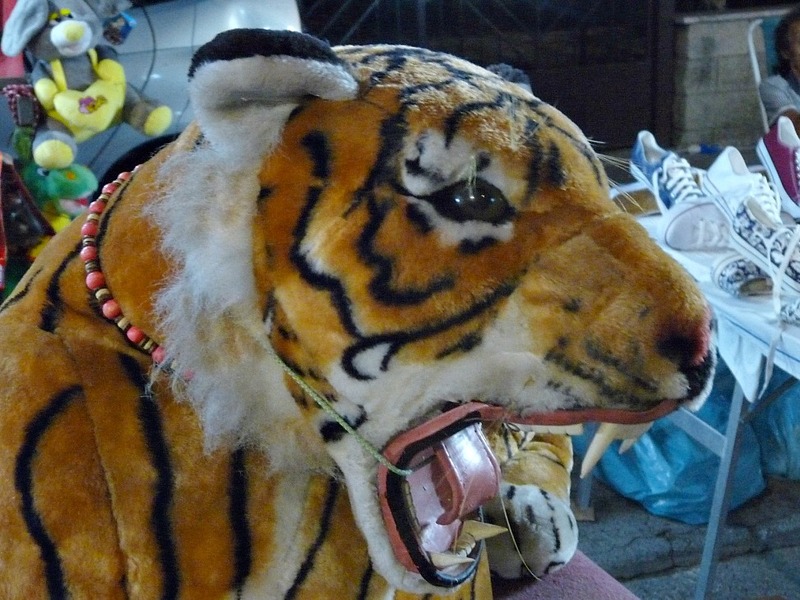 There are also scenes depicting the preparation of typical local produce. 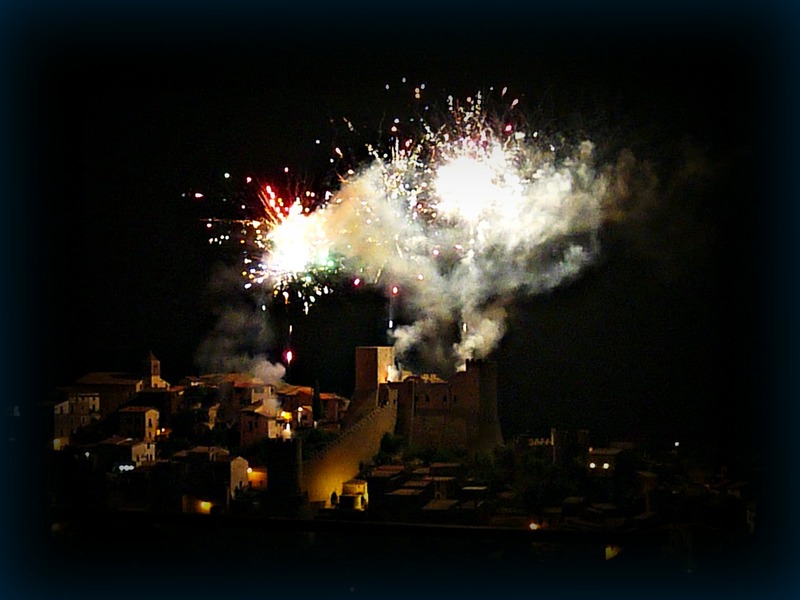 Over the festive Christmas period Maranola has three editions of this event. These are normally held on the 26th December, New Years Day and on the day of the Epiphany, the 6th January. Last year we attended the last event. The sound of the pipes of the zampognieri heralded the arrival of the Three Kings bearing their gifts. They all made their way to the stable when the charming Nativity scene was taking place. A local couple with a young baby played the roles of Mary, Joseph and the baby Jesus. We really are hoping to visit Maranola again this Christmas. This is a very special local event – not to be missed. Well may we take this opportunity to wish you all a very Happy Christmas and Peace and Goodwill to all. We also wish you all the very best in the coming New Year. Over the Autumn we have had a string of friends and family members come and visit us at Tre Cancelle which kept us busy. 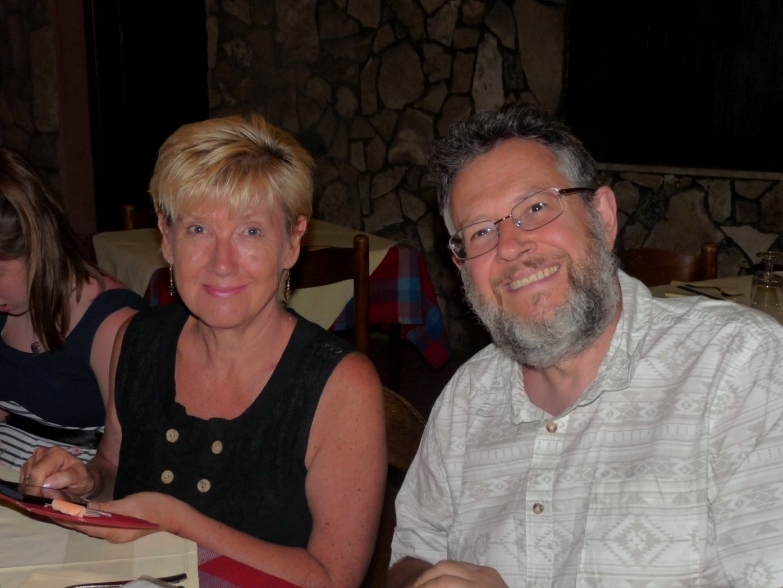 First we welcomed our friends: Clive and Marilyn who used to live in Gaeta. For several years Clive used to help Paul a great deal in the olive grove before their move back to the UK. 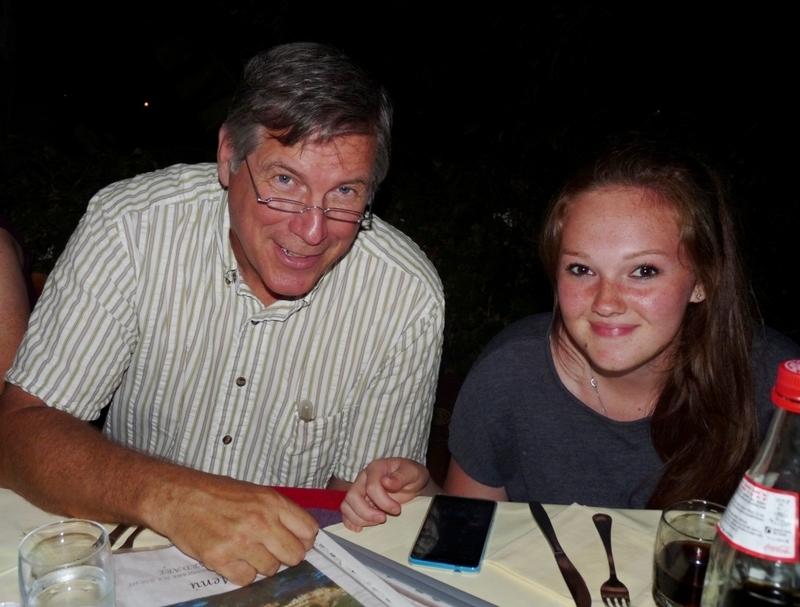 They treated us to a lovely meal at a restaurant in Gaeta named the Masaniello. My cousins Cathy and Jeff from Australia came to stay for a a week and also Paul’s sister and her friend Linda. They also helped Paul to celebrate his birthday. They also have us an amazing hand in clearing and preparing the olive groves for the harvest. Thank you all for you wonderful efforts !!! No sooner had this party departed another arrived in the form of came our friend Kay and also friends Gerda and Adrian from South Africa who had recently got married. The couple had been doing a 30 day whistle-stop tour of Europe visiting 5 countries, 22 towns and villages in Holland, Belgium, France, Spain and Italy. And they still managed to fit in a few day’s visit to see us at Tre Cancelle. Amazing guys !!! We also welcomed two of Kay’s friends, Nicky and Simon. All had come to help with the olive harvest. Our American friends from Minturno and Nandi, Davide and their three children from Itri, Tomaso, Dante and Giada, also volutuneered to help for a couple of days which was fantastic to have some extra pairs of hands. This year we had a decent crop much to Paul’s delight . Over a couple of weeks with our team of volunteer workers we managed to harvest 1000 kilos of olives which were turned into about 180 litres of November harvest extra virgin olive oil which was really good news. At the same time we also managed to prune some of the trees that were growing too far too tall. Our sincere thanks to all those who took part and helped to make it such fun. It was an outstanding team effort. 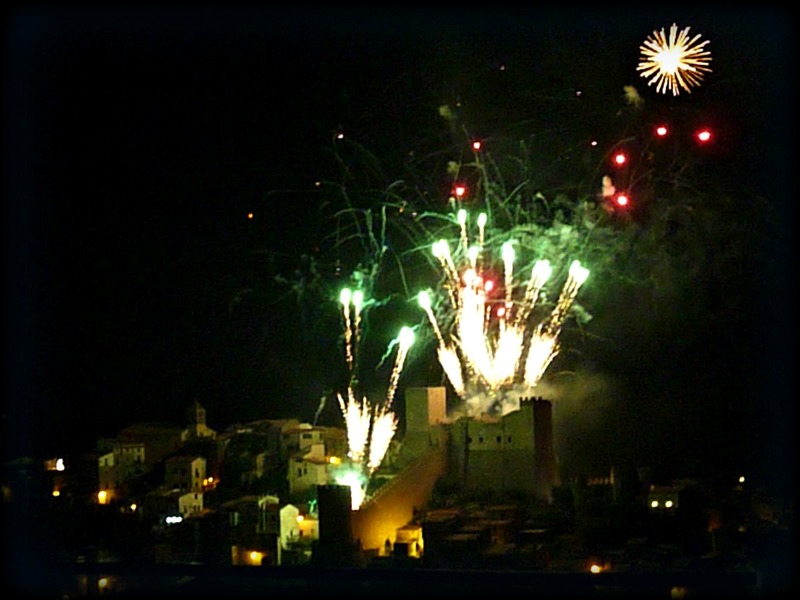 Each summer at the beginning of July the town of Minturno comes together to celebrate the Festa delle Regne or the Wheat Harvest Festival. This year marked the 63rd edition. 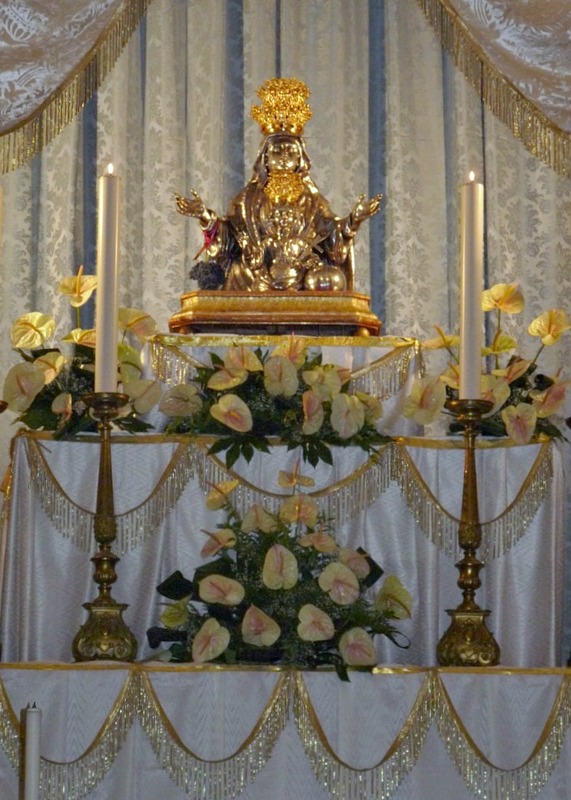 The main feast day celebrations are held on the second Sunday of July when thanks are offered to the patron of the town, the Madonna delle Grazie. Historically monks of the Franciscan order used to bake bread that was then distributed to the poor. 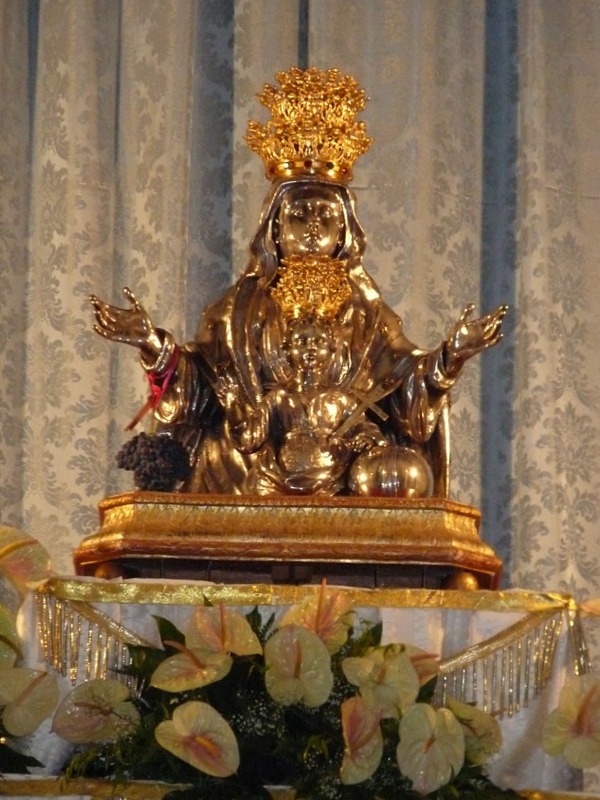 There is a procession throughout the old town where the statue of the Madonna and child is carried on a rustic cart decorated with wheat sheaves, and pulled by a pair of strong oxen. There is also a parade of decorated carts and trailers, representing the harvest, that have been submitted by various neighbourhood groups. 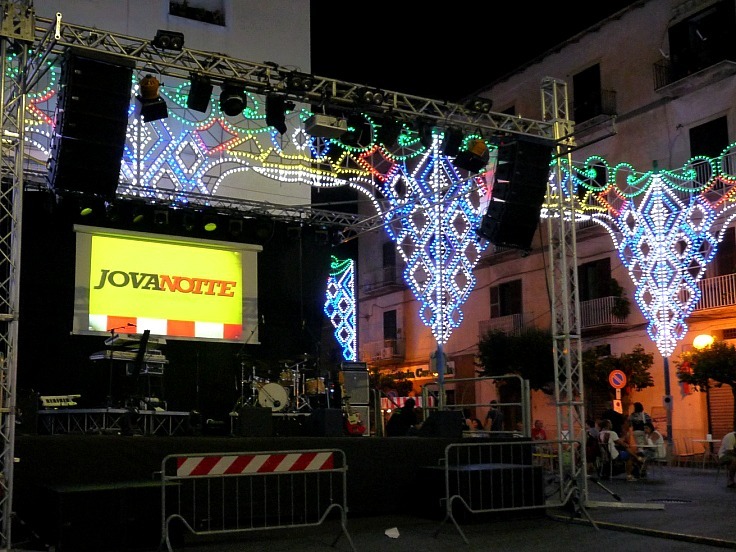 These are towed up to the main square of Minturno and a prize is generally awarded for the best design. The designs are incredibly intricate and detailed. There is a long and colourful parade made up of various groups, these include characters dressed in elegant medieval costumes, sbandieratori or flag throwers and musicians. 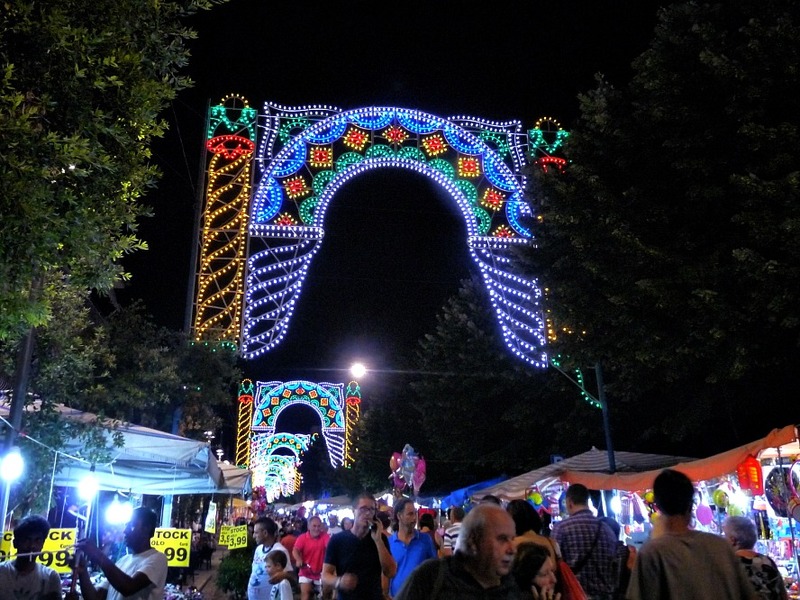 The Associazione Folklorica di Minturno was formed in 1989 to strive to promote and keep alive the town’s popular traditions, culture and musical heritage. From a young age local children are encouraged to learn about their traditional heritage. There are dance classes organised to suit all ages and troupes of dancers are put together. Throughout the year the skilled dressmakers of Minturno busy themselves by sewing fine costumes that are typical of this area. The most famous Minturnese costume is called “la Pacchiana”. This has the characteristic elaborate head-dress made of a starched and folded white linen or muslin cloth, which is edged in lace. There is a white blouse with full puffed sleeves, made of a finely pleated material, which are gathered just above the elbow. The laced bodice is richly embroidered in gold thread, and over this a cream-coloured shawl is worn over the shoulders, once again decorated with gold embroidery. The skirt is long and black. At the front a black silk apron is worn, while at the back there is the addition of a special fold of red material known as a “pagnuccia”. The costume wearer is also adorned with abundant gold jewellery and large earrings. Historically, these ornate costumes would have only been worn on special feast days or at weddings. Often the beautiful treasured costume would be passed down in families from mother to daughter. The men’s clothing typically consists of a black jacket, a white frilled shirt with wide sleeves, knee length trousers, a wide red band tied around the hips, black shoes and bright red stockings. At the festival the groups perform numerous traditional dances such as the tarantella and the saltarella. 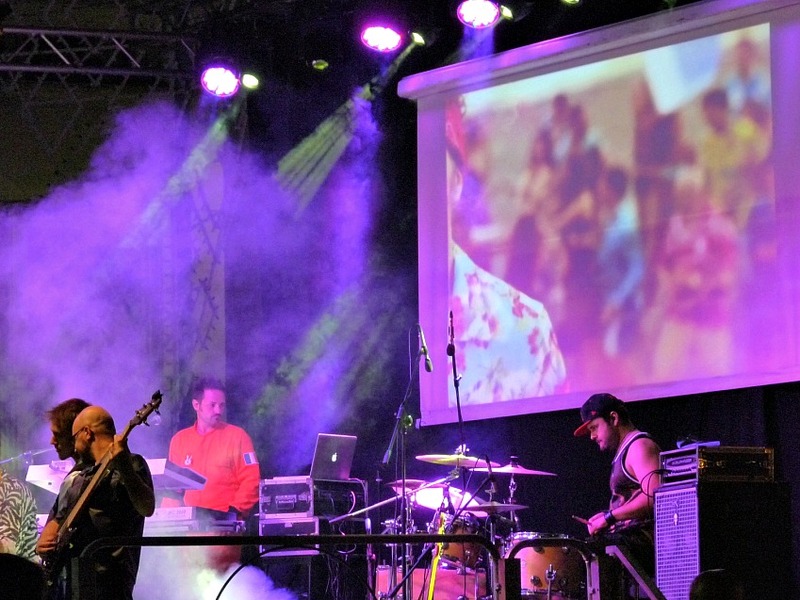 On the same Sunday evening as the Feast of the Wheat Harvest, Minturno also hosts an acclaimed International Folklore Festival. This welcomes other dance troupes from around the world to share their cultural heritage and traditions. 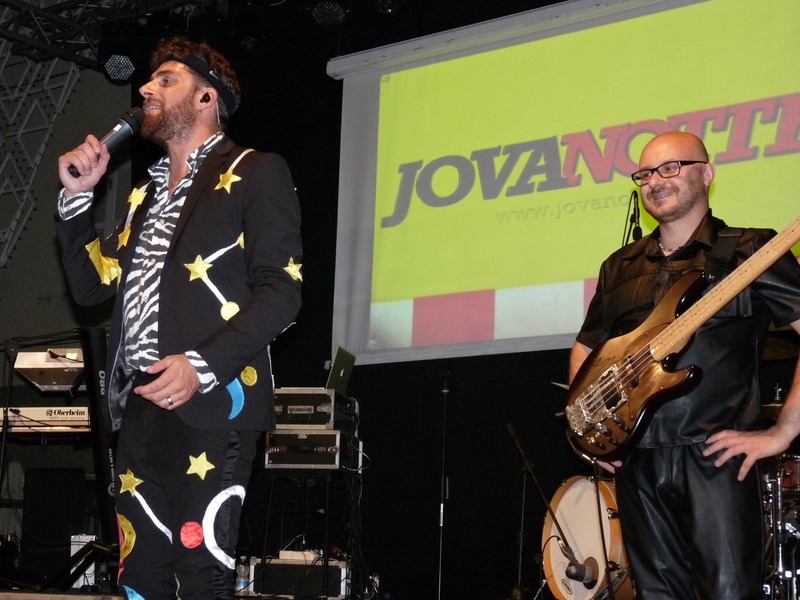 This year there were colourful performances by groups from Chile, Mexico, Macedonia and Maldova. In this cultural exchange dancers, singers and musicians from all around the world can meet up and share their traditional cultural heritage and ethnicity in an atmosphere of warmth, friendship, peace and harmony. The Fattoria Santa Lucia is a modern farm complex located near to Minturno and Sessa Aurunca, along the ancient Roman thoroughfare of the Appian Way, not far from the River Garigliano which divides the regions of Lazio and Campania. Buffalo have been farmed on these plains for many centuries, yet the buffalo, bubalus bubalis‘, is not an animal indigenous to Italy, in fact it originates from the of East India. There is some debate as to how and when the buffalo were introduced into Italy. Some historians believe they were brought here by the Saracens while others think it was down to the Lombards. However it is known that there have been buffalo farmed on the plains of this area of southern Italy for many many centuries. The Fattoria Santa Lucia has a large herd of buffalo and it welcomes visitors to its premises. It also welcomes school parties and offers educational tours. You can observe the buffalo in various areas of the farm. It soon became apparent to me that there is nothing a water buffalo likes more on a blisteringly hot day in Italy than to wallow and roll in a pool of mud, to help protect itself from the heat. Dotted around the farm there are interesting educational panels regarding the breeding of the livestock and how the animals are fed and cared for. There is another section with the mothers and their young calves. The babies are so adorable. A lactating mother can produce 7 litres of milk a day which is high in protein content and essential vitamins especially vitamin B, K, and J. Following the milking process the milk must be quickly chilled to a temperature of 4 to 6 degrees C.
Rennet is then added to the milk to form the curds which are then heated in the whey to form strings which give the mozzarella its elastic consistency. The strings of curd are then cut – The term mozzarella is derived from this procedure called mozzare which means “cutting by hand”. The curd is then formed into the characteristic balls of soft milky cheese. 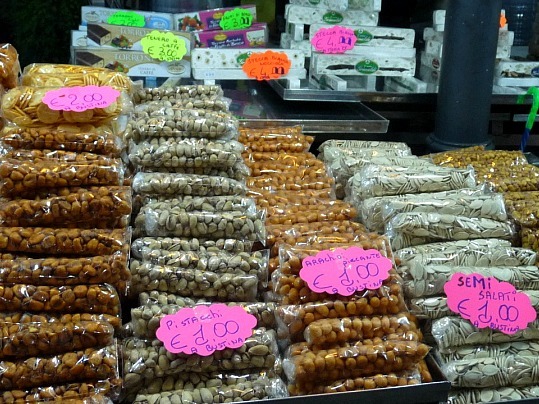 The smaller sized balls are known as boccancini. The cheese can also be formed into plaits. 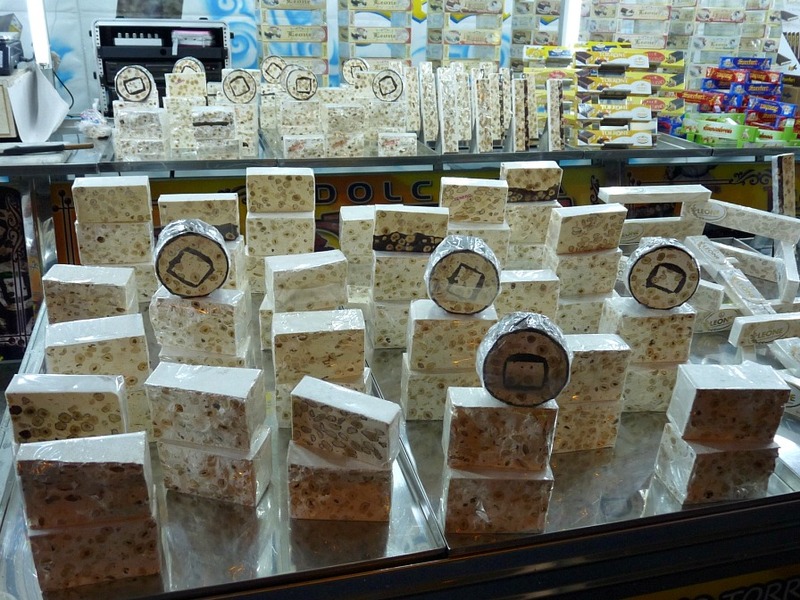 Mozzarella produced in this area has the certification of Mozzarella di bufala campana DOP. 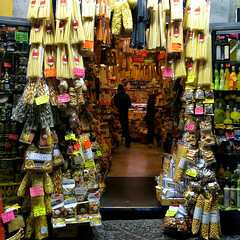 On the farm is a small shop where you can buy the freshly produced Mozzarella and other delicious locally produced products. The cheese is best preserved in some of its whey and should ideally be consumed within a day or two of purchase. We love it served sliced or quartered together with sun ripened tomatoes, chopped basil and a generous drizzle of our own Tre Cancelle November Harvest Extra Virgin Olive Oil. 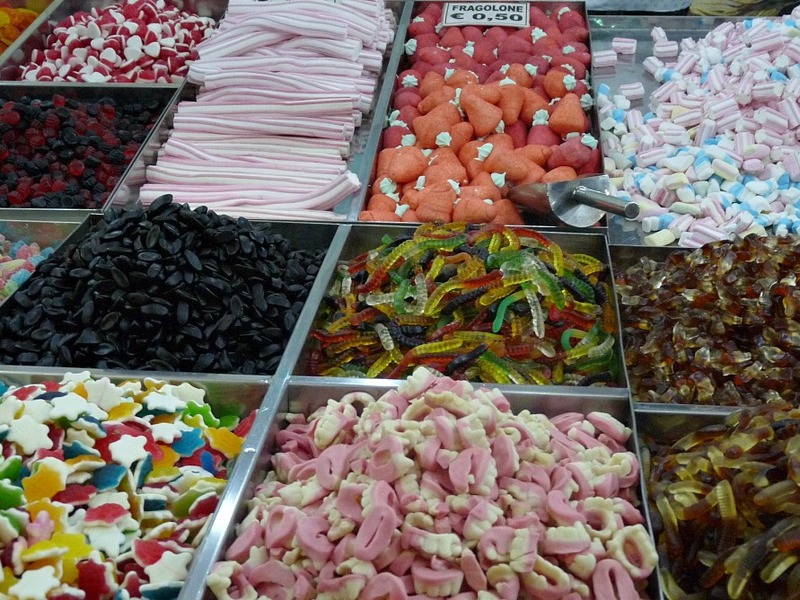 Delicious – there’s nothing quite like it !!! The farm also has an agriturismo, a restaurant where you can sample the local produce and traditional dishes. Well as you can see we have had a busy full-on year here at Tre Cancelle. We’ve had the pleasure of meeting some really lovely people, sharing special times with family, friends and visitors, visiting some really beautiful places and enjoying the peace and tranquility of Tre Cancelle. We are so lucky and we have so much to be grateful for. 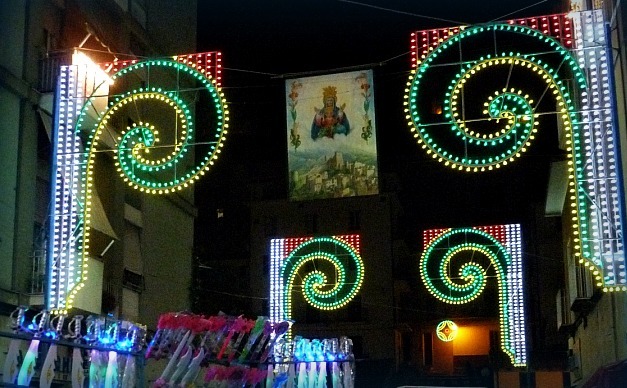 Here are some photos of the Christmas decorations in the nearby seaside town of Gaeta. and also wishing you all the very best during the year ahead. When friends come and visit we usually take them for a little run in the car to show them around our local area of South Lazio. In November our friend Annette and her friend Sarah came to stay with us at Tre Cancelle for a few days. The girls at the Cafe Centrale in Itri – Hot chocolate so thick you need a spoon. The weather was still calm and very mild, so we of course took them for a snack lunch to the Miramare at Sant’Agostino beach. 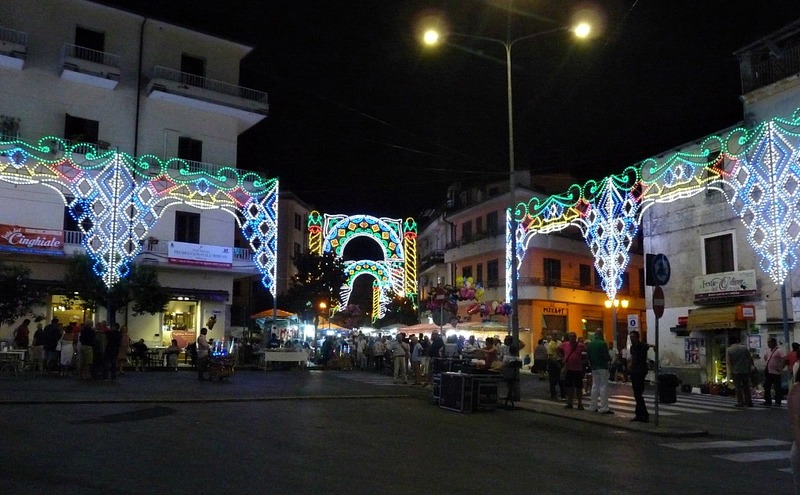 Then on to Sperlonga which can be very beautiful at this time of year. View of Sperlonga’s Ponente Beach. The Grotto of Emperor Tiberius. A square in the old historic centre. Wandering through Sperlonga’s maze of little alleyways. There is something to see around every corner. Sunset over San Felice Circeo. Come Discover Beautiful Sperlonga !!! My wonderful Italian friend Florisa is always busy, whether it be cooking, cleaning, working, harvesting olives or helping people, friends and family. She has such a very kind and generous nature. However the thing that she loves the most is her garden. She really does have green fingers, or as they call it here in Italy “pollice verdi” which curiously translates as “green thumbs”. She really does knows how to make her garden grow. It is a delight to wander through it. This will be just a photo blog, as I believe the pictures will speak for themselves. Isn’t it just amazing !!! Florisa with some of her home grown strawberries. 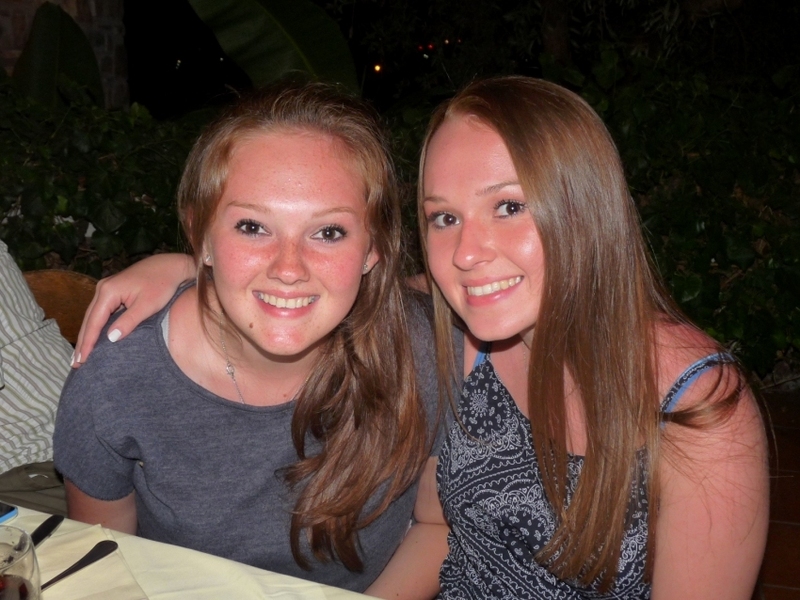 At the end of April we welcomed two lovely ladies, Lissa and Debra, from the USA. 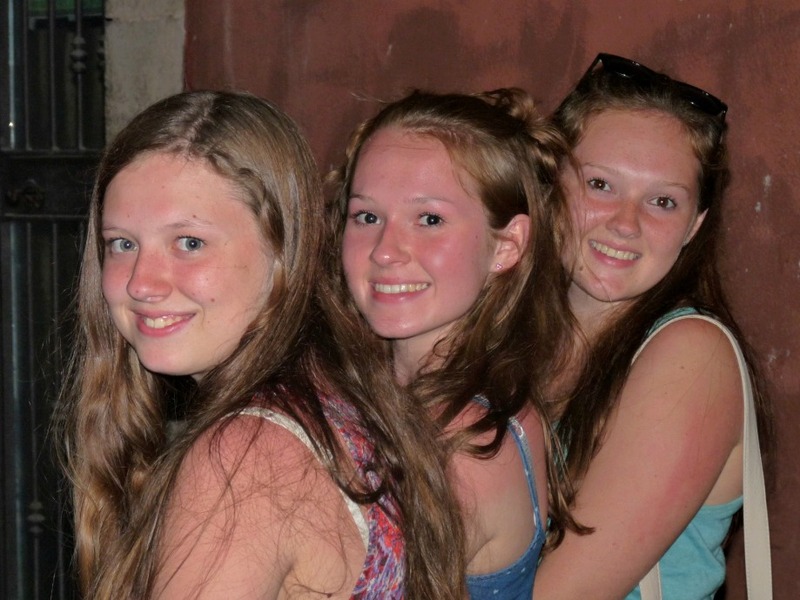 This was to be their first trip to this area of Italy and Lissa was keen to visit her ancestral home of her family, namely Pastena. Pastena is a small but picturesque medieval village which is in the province of Frosinone and belongs to the ancient region of Ciociaria. As Lissa and Debra didn’t have a car we offered to drive them to Pastena, which is along an interesting route, passing through Fondi and then heading inland towards Lenola and beyond. Finally we reached the verdant plain of Pastena surrounded by hills and mountains. Here the soil is rich and fertile thus agriculture has always been the mainstay of the economy in these parts. As we approached Pastena we saw a hill which at its peak has modern sculptures representing the patron saints of the town, Sant’Elena and San Sinforo. Lissa first wanted to call in at Pastena’s Register Office or Anagrafe in the Town Hall. We were received by the registrar who seemed to be rather flustered and busy, and he insisted that he did not have time to look through the records to try and find out more about Lissa’s ancestors. However he did take details from her and promised to look for them during the next few days. Feeling slightly deflated we went for a stroll around the old town. Close to the Town Hall is a museum – “Il Museo della Civiltà Contadina e dell’Ulivo” or Museum of Country Life and Olive Cultivation.This is housed in a palazzo which was once the home and an ancient olive m of the Trani family. Among the interesting exhibits are the original old mill-stone and press, tools related to olive farming, tilling the soil, animal husbandry, wine making, cheese making, basket making, spinning and weaving of linen. Also there are examples of traditional clothes, musical instruments and general domestic items of everyday Pastena life in times gone by. Lissa also wanted the visit Pastena’s cemetery which was situated a little way out of town. She was hoping to find some of her ancestors’ graves. We went back into Pastena to wander through the characteristic Medieval centre. At the highest point of the village is the main square and the church of Santa Maria Maggiore. On the facade are two niches which house images of the patron saints of the town. 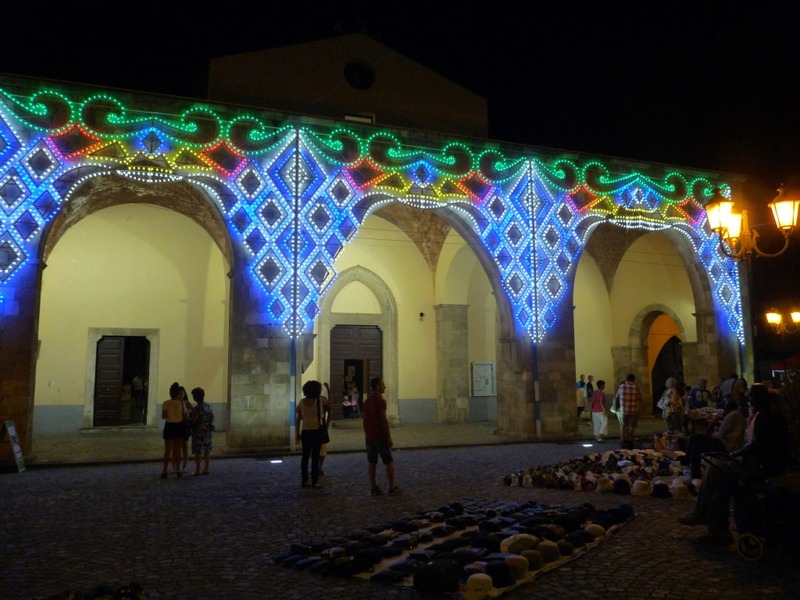 We noticed that there were festive lights mounted throughout the town. We learned that the following day was the Feast of “Il Maggio” or “la Festa del’Albero della Cuccagna” -a festival to celebrate the coming of Spring. We soon made plans to return the following day, with our friends Pat and Melinda, to see the celebrations for ourselves. On the 15th April the local men go out into the woods to choose the best tall straight cypress tree. Once this has been selected a cross is carved out of the bark mark it. At sunrise on the morning of 30th April many of the local men folk will gather around the chosen tree for a traditional ceremony where the parish priest recites prayers. The master of ceremonies takes the axe and makes the first cuts into the tree, in the presence of the calf, with each of the participants taking their turn to wield the axe. The actual felling of the tree is marked by gun shots and a drum roll. The tree is then cleaned of the bark and branches etc. There follows a ritual “funeral” procession for “the tree of sacrifice” that has been taken from the “sacred forest”. Slowly but surely it is hauled up to the village with the help of a numerous pairs of strong oxen, lead by the sacred calf. During the long procession loud firework were periodically set off, and unnervingly groups of hunters shot rounds from their rifles and shotguns into the air. We then walked uphill back towards the town. As we entered the square in front of the town hall we were spotted by the register who eagerly tried to flag us down. He told Lissa he had looked in the registers and had found several more generations of Lissa’s family. He lead us into his office where he handed over the paperwork. Lissa was happy and we were so pleased for her. We took a photo of the Registrar, Lissa and Debra to remember this very special day. 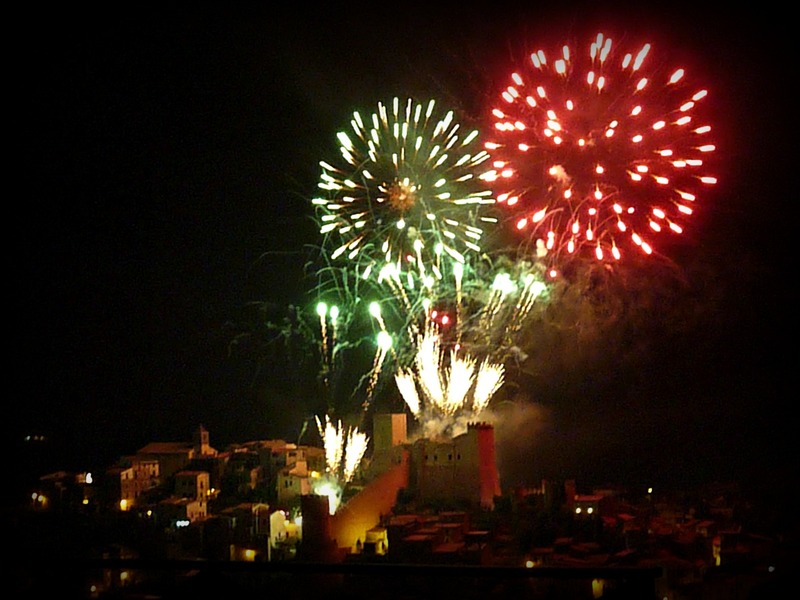 A little more about the “Il Maggio” festivities …. On the 1st May the tree is cleaned in the main square, in front of the church of Santa Maria Maggiore. The top of the tall tree trunk is adorned with May flowers of broom. A hole is prepared and then the men work together using ropes to gradually winch the tree trunk into an upright position. 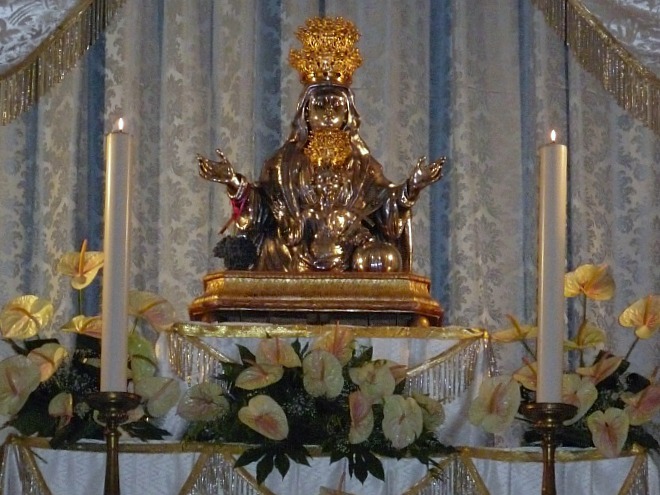 On the 3rd May, on the feast day of the Santissima Santa Croce, when the statue of Sant’ Elena on her throne is taken from the church and carried around all the districts of the town followed by a solemn procession. Typically the womenfolk have previously prepared a type of sweet bread / doughnut in the shape of a decorated ring called a Ciambellone, these are carried during the procession as a symbol of religious devotion. The procession is accompanied by ceremonial gunfire. Later in the day the tree trunk is raised into position in the main square, having been covered in grease. This is known as the “albero della cuccagna”. Then there is a competition amongst the young men of the village, when they attempt to scale the slippery pole. At the top there are prizes for the successful climbers. 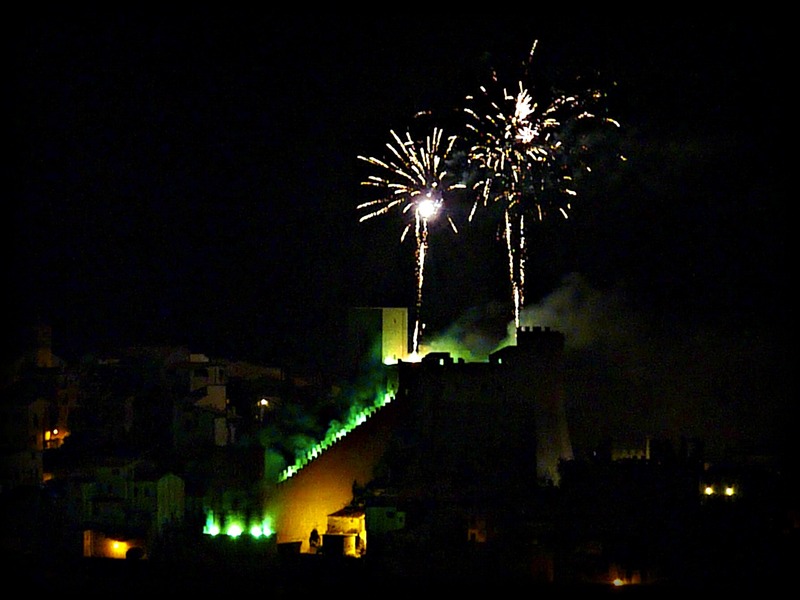 In the evening there are more celebrations of musical entertainment and fireworks. The tree trunk remains in place in the square until September, when it is cut down and distributed as firewood to the local inhabitants of Pastena. We are delighted to have our friends, the White family and three of their girls, staying with us once again at Tre Cancelle. 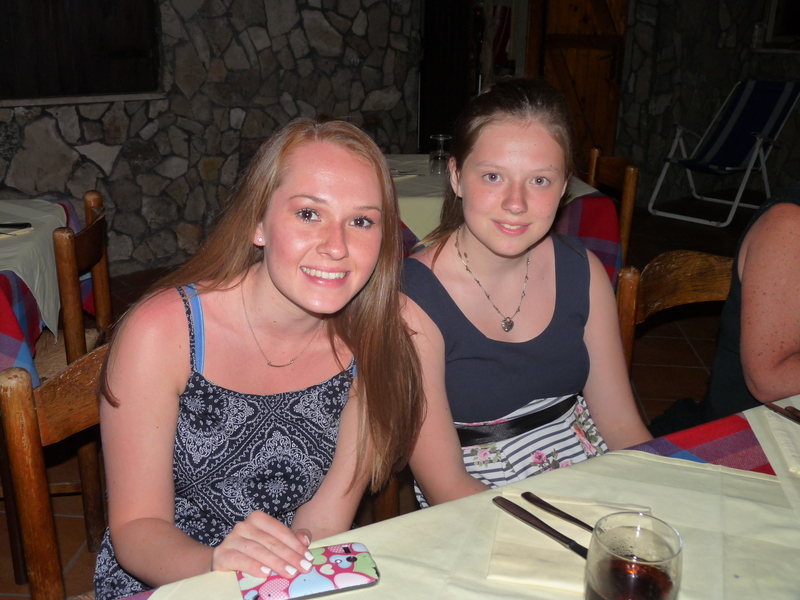 You may remember that Niamh had already spent a month here in June with her elder sister Shannon. 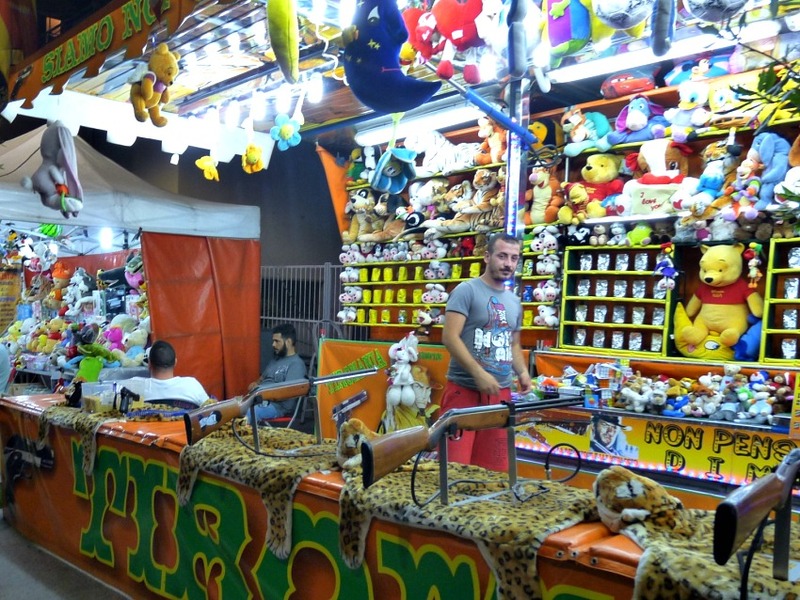 One evening we decided to trundle down to Itri to check out this year’s summer festival. 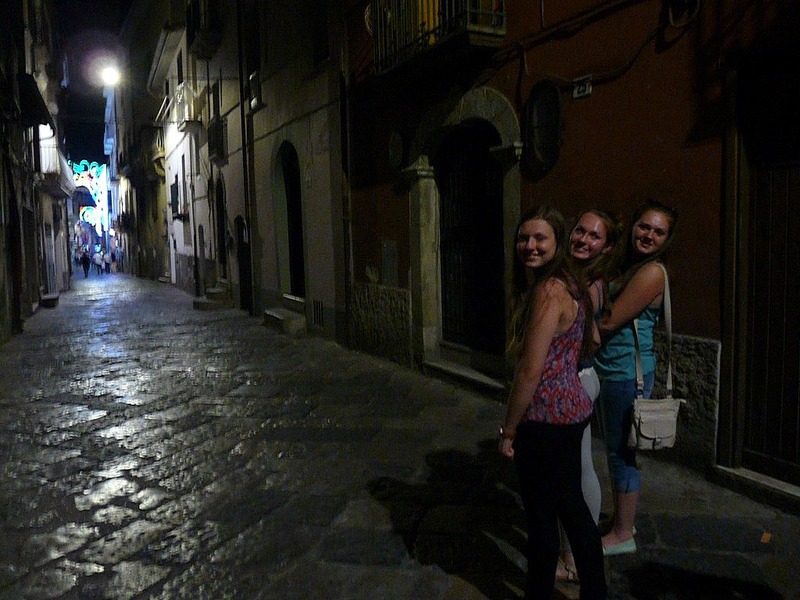 Here are the girls heading down the old Roman Via Appia towards the main square of Piazza Incoronazione. 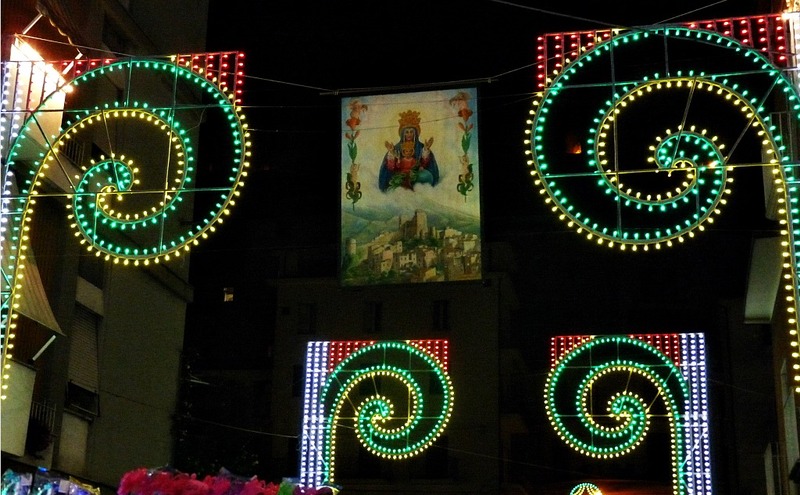 The festival is dedicated to the Madonna della Civita who is the patron of the town of Itri which nestles in the foothills of the Aurunci Mountains. 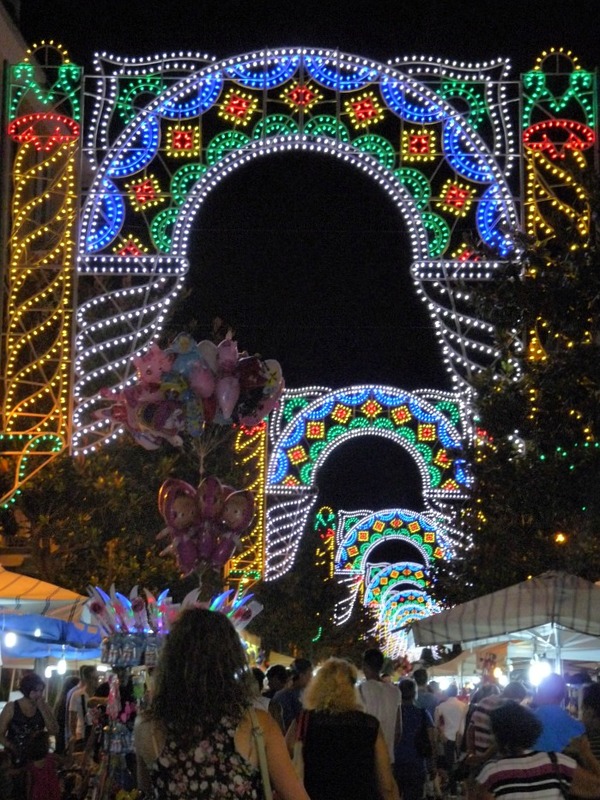 The main streets were decorated with brightly coloured illuminations. 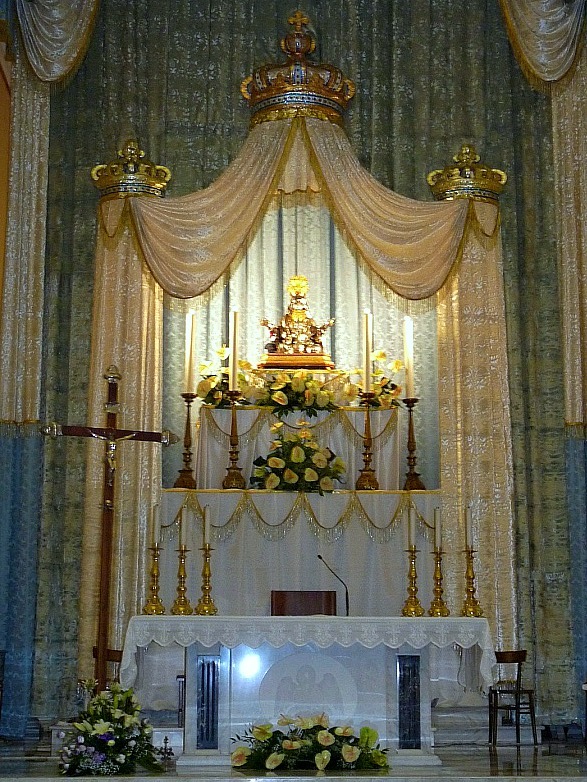 A stage had been set up for the evening’s musical entertainment. 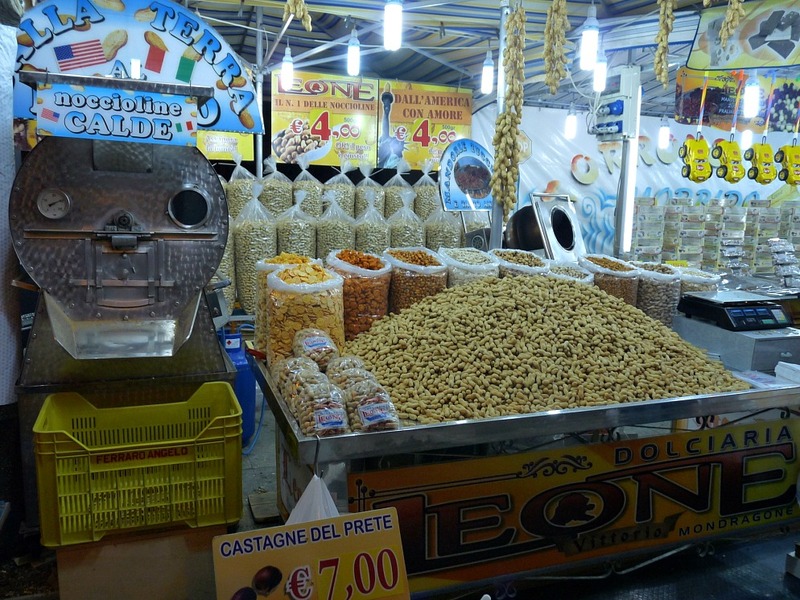 The long road of Via Farnese was lined with stall after stall of amusements and street vendors. 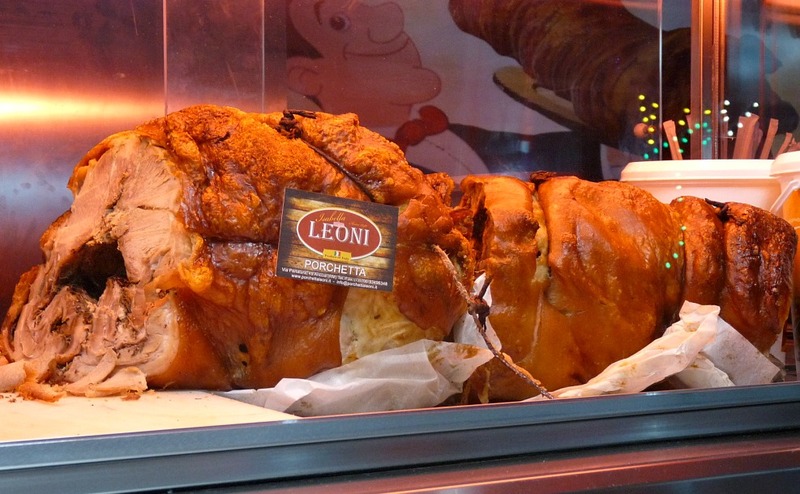 There were numerous food stalls selling items like roasted peanuts, lupini, multi-coloured sweets, nougat, candyfloss, guanciale, and rolls filled with porchetta. Also for sale were every type of clothes, shoes, trainers, hats, caps, jewellery, watches, sunglasses, trinkets, noisy children’s toys, household goods, terracotta cooking pots, handy kitchen gadgets, garden implements, artificial flowers, holy paintings, goldfish, ducklings, parakeets … you name it there was a stall selling it !!! On almost every available piece of pavement there were African peddlers, who could not afford to rent a stall, so they simply displayed their wares on a sheet stretched out on the ground. I took a peek inside La Chiesa dell’ Annunziata. 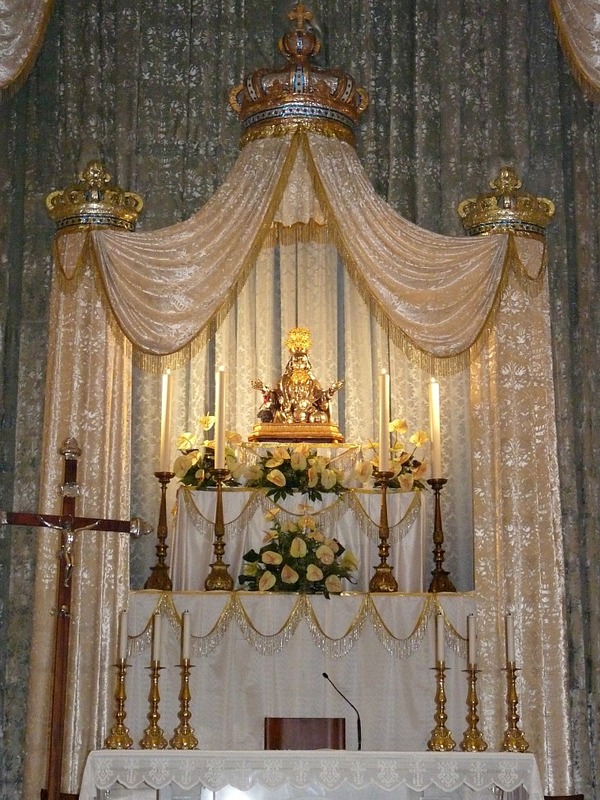 Here the resplendent silver statue of the Madonna and Child is displayed for all to see, resting on a lavishly decorated altar. When I stepped outside I could hear that the music had already started. 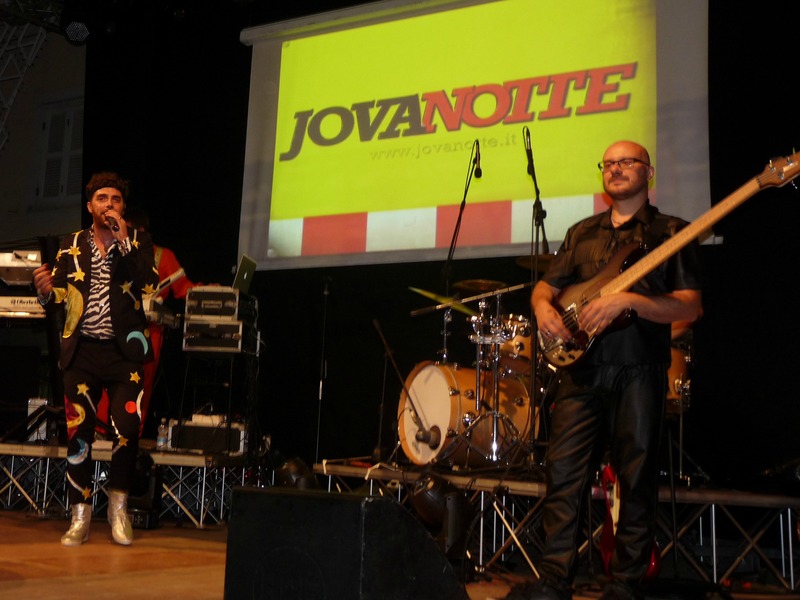 This evening a Jovanotti tribute band, known as “Jovanotte”, were to give a free concert in Itri. 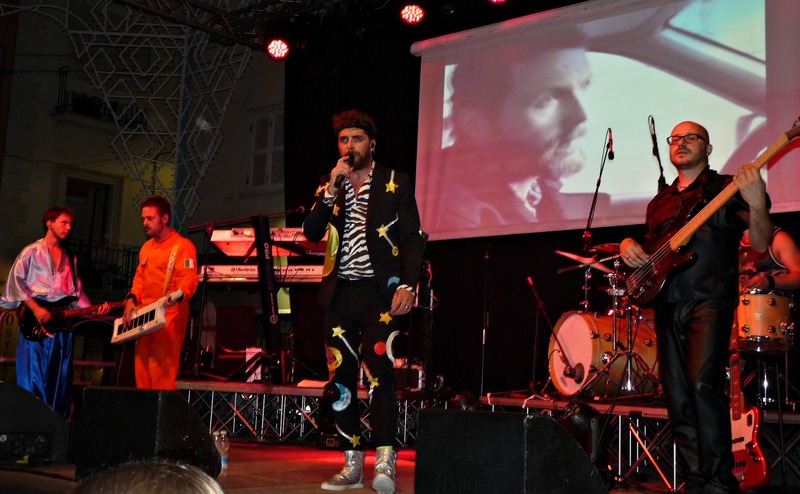 We were impressed by their musical ability and the energy of their performance. Well their music certainly got Paul’s feet tapping !!! 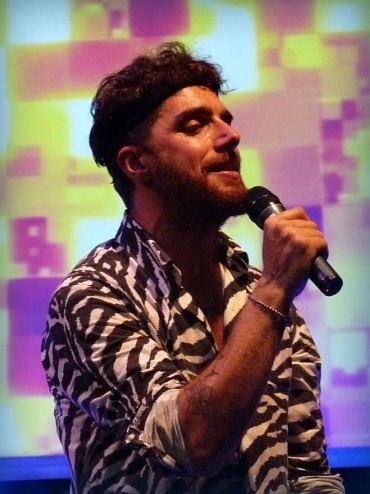 The following evening was the last of the festival. Having seen all the stalls the night before, we all decided to meet up for a pizza with Pat and Melinda at the Bellavista. 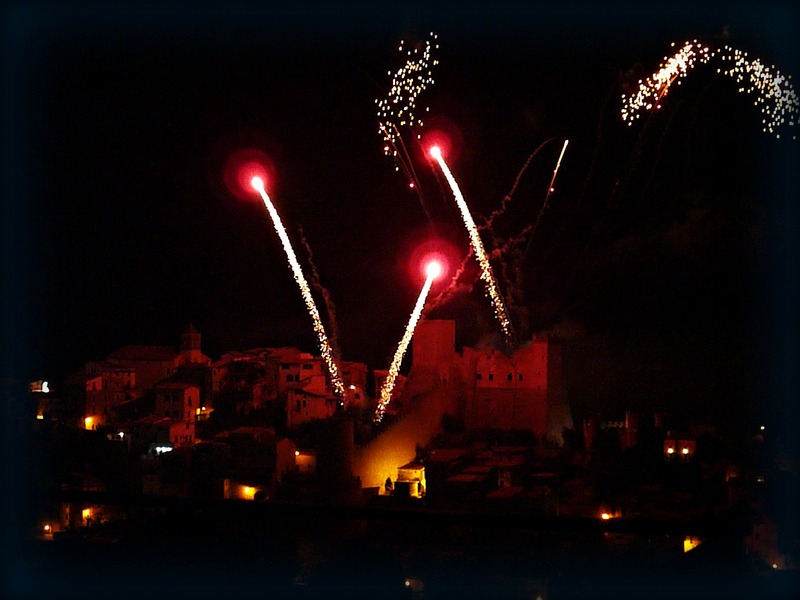 We enjoyed a cheery evening while we waited for the grand finale of the Festa della Madonna della Civita, a spectacular firework display. 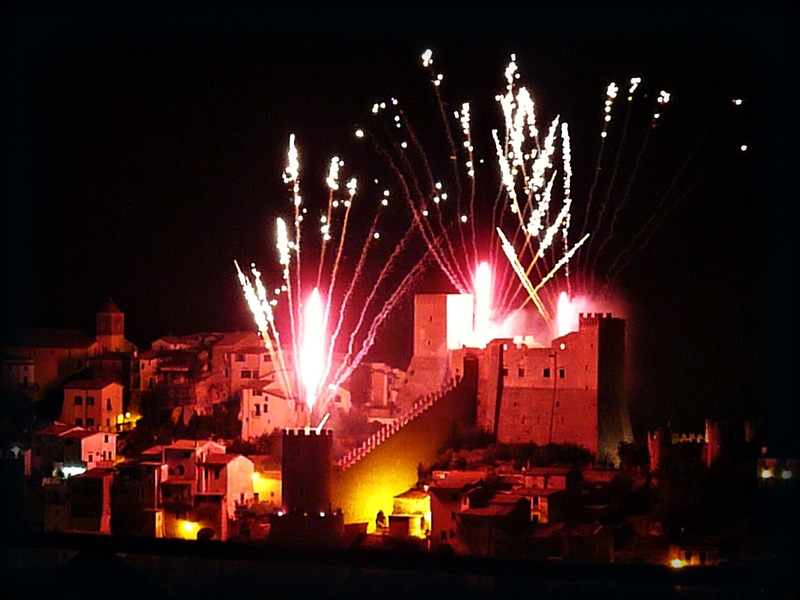 The Bellavista has a superb view of Itri and its ancient castle. 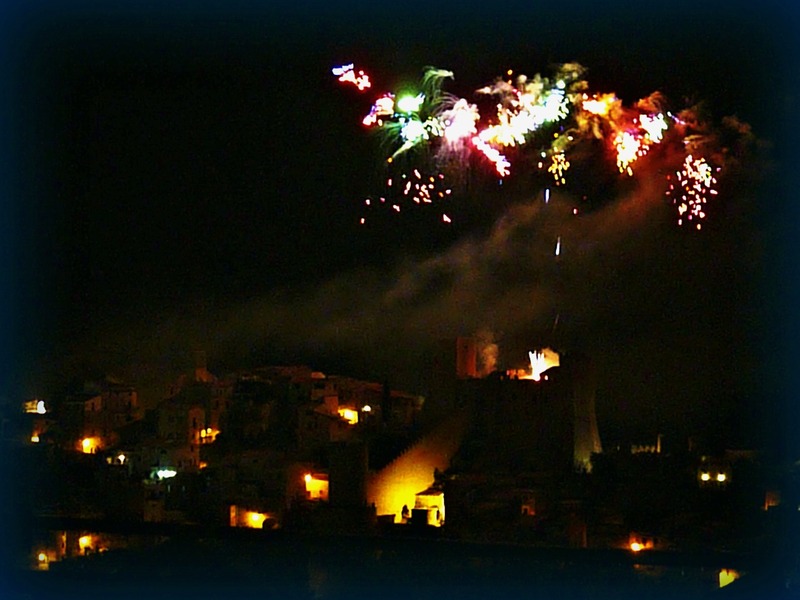 It astounds me how a little town like Itri can put on such a magnificent firework display every year. Brava Itri !!! We love you !! !